Japanese Vogue takes a walk on the wild side with Ethiopian supermodel Liya Kebede commuting on New York's underground subway system for its April 2013 issue. Kebede dons various ethnocentric garb including an African-themed headdress, a larger than life Afro, and a smattering of beaded and metallic jewellery pieces. Kebede takes to the subway system like a duck to water albeit clad in Lanvin, Saint Laurent, Balmain, Tom Ford, Balenciaga, and Marc Jacobs with styling by George Cortina. In typically New York fashion, Kebede barely registers a bleep amongst the commuters as they feign disinterest in the spectacular vision of loveliness in their midst. 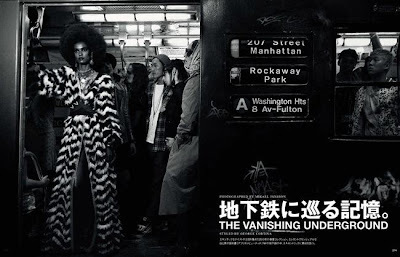 Photographer Mikael Jansson perfectly encapsulates the mood of the Manhattan subway with a melting pot of cultures and people from all walks of life going about their daily rituals. Kebede as always pulls off each look with a grace and elegance that has kept her at the top of the industry ladder for over a decade.